Corrosion is the most frequent cause of structural failures. Industrial coatings serve as a protective barrier between substrates and the corrosive elements that destroy them. ON-SITE TECHNICAL SERVICES, INC. has extensive coating inspection experience in both fabrication shops and the field, verifying conformance with today’s rigorous painting specifications. ON-SITE’s NACE certified inspectors provide the expertise to assure the quality of coating application and maintenance through inspection and documentation during the application process. Quality Assurance services of applied coatings include structural steel, tank interiors and exteriors, bridges, pipelines, and petrochemical facilities. Quality Assurance Services are highly desirable for protecting your interests during the application of coatings in the fabrication shop and filed applied coatings. Our experienced inspectors work to assure that that all aspects from ambient conditions and surface preparation, through final coating dry film thickness and curing are correct and in accordance with the specification the manufacturer’s application recommendations and industry standards. Our inspectors are equipped and trained on the necessary instrumentation to provide thorough surveillance. Comprehensive documentation is prepared daily detailing job quality and progress. This close oversight enables the inspectors to identify potential problems and recommend solutions before the work progresses to a point where costly rework is required. ON-SITE personnel have extensive in house training and/or certification by the National Association of Corrosion Engineers (NACE). 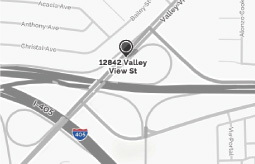 There is continuous in-house training to maintain this high level of technological expertise. In addition, there is both a rigid safety program and a Quality Assurance Program to ensure a full understanding of the customer’s requirements. With the increased concern of corrosion protection the ON-SITE team, has a vast amount of experience performing inspection of a wide variety of protective coatings and linings from Extruded Polyurethane, Cold Applied Plastic Tapes, Coal Tar Epoxy, Fusion Bonded Epoxy, Polyurethane lining systems to Cement Mortar linings and coatings. ON-SITE is often called upon to access and evaluate difficult protective coating system applications and update client specifications. Newbury Park Reservoir and Grimes Canyon Reservoir’s are new 5 million gallon steel reservoirs erected to meet the Districts water demands. The reservoirs are 160-foot-diameter, 39-foot-high and built simultaneously. During the course of the projects, ON-SITE Inspectors were responsible for providing Consultant Quality Assurance services in multiple shop and field locations for these steel reservoirs. With the significant concern in regards to the life expectancy of the reservoirs the incorporation of numerous corrosion protection features was specified. Our field inspection activities included witnessing application of the protective Epoxy coatings, to ensure compliance with the rigorous specification requirements. This involved constant monitoring of the abrasive blast operations, verifying blast profile, and verifying of the environmental conditions during all coating application. Final visual inspection, DFT thickness tests and witnessing holiday tests was completed after the coating was fully cured. 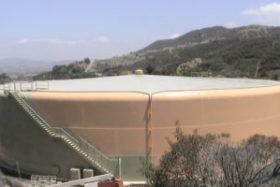 The Lake Hodges Pipeline and Hydro Electric Pump Station is a part of San Diego County Water Authorities Emergency Storage project. This project required significant corrosion protection systems for the piping and engineered equipment. 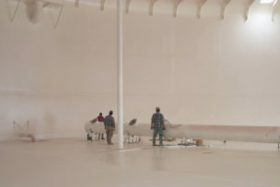 In addition to the more traditional protective coating systems that included a combination of cold applied plastic tape and cement lining the project employed polyurethane linings and epoxy coatings as well. ON-SITE was tasked with the evaluation of the protective coating during application and testing which includes abrasive blast verifications, blast profile reading, paint application, witness of adhesion testing and evaluation of overall conformity to the specification requirements. 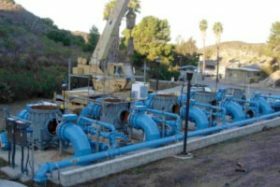 The San Vicente Pump Station Projects are a part of San Diego County Water Authorities Emergency Storage project, which required significant corrosion protection systems for the piping and engineered equipment. In addition to the more traditional protective coating systems that included a combination of cold applied plastic tape and cement lining the project employed polyurethane linings and epoxy coatings as well verifying abrasive blast operations, blast profile reading, paint application, witness of adhesion testing and evaluation of overall conformity to the specification requirements. 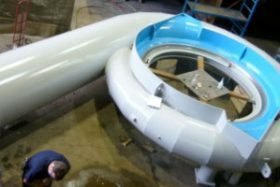 ON-SITE provided shop fabrication inspection services during the application of protective coatings of the mechanical equipment and 5,000 ft of large diameter steel pipe and specialty fittings associated with this project.